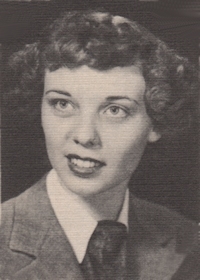 Obituary – Swearingen, Collette Dean (Williams) « Perry High School Alumni Association, Inc.
﻿Perryscope Staff 49-50, Y—Teens 47-48, Band 48-49, Office Staff 47-48, Class Secretary 48-49, Home Room Secretary 46-48, Football Queen Attendant 48-49, Junior Play 48-49, Student Council 47-48. Collette Dean Swearingen, 73, Stillwater, died Saturday, Nov. 12, 2005, in her home. Services will be at 10 a.m. Tuesday in Palmer Marler Carberry Funeral Home Chapel in Stillwater. Pastor Paul Anderson will officiate. Interment will follow at 1 p.m. in Grace Hill Cemetery in Perry under the direction of Palmer Marler Carberry Funeral Home of Stillwater. Swearingen was born Sept. 14, 1932, in San Angelo, Texas, to Roy and Margaret (Jones) Williams. She received her early education in Perry and graduated from Perry High School. She attended Oklahoma College for Women in Chickasha and graduated with a bachelor’s of music degree in piano. After graduation, she returned to Perry to live with her parents and opened a teaching studio in the original First National Bank Building. She married Dean Swearingen on Aug. 17, 1956, in Perry. They lived in Perry and commuted to Stillwater while he pursued a career in the oil business. They also lived in Ada, and she worked as a secretary in the family owned DES Engineering Company. After her husband died in 1994, she moved to Stillwater to be near her two children. She was a member of Stillwater Woman’s Club and A.A.R.P. In addition to her husband, she was predeceased by her parents and one brother, Robert E. Williams. Survivors include one son and his wife, K of Stillwater; one daughter and her husband of Stillwater; one brother and his wife of Denver, Colo.; and two grandchildren.